Read my book . . .
1. The beginnings of my research (1989-1994): many doubts and hard work . . .
My work on the history of the telephone was originated from a brief investigation I made in 1989, a few months before my retirement, on the merits of Antonio Meucci in the invention of the telephone. I thought that I would spend in that investigation no more than a few weeks and that I would possibly write a 10-page paper. Instead, I worked on it for more than fifteen years, I wrote two books—a first two-volume 1200-pages book and a second of about 400 pages—and dozens of papers and lectures. Still now (year 2010), I occasionally touch again on the matter, following invitations to lecture or to write a paper, or merely to meet with requests of clarifications by scholars. I will try to recall how could that happen. It all began in the spring of 1989, when a journalist of my acquaintance asked me what we (telecommunications people) had in mind for celebrating the 100th anniversary of Antonio Meucci’s death, occurred in Staten Island, NY, on October 19, 1889. 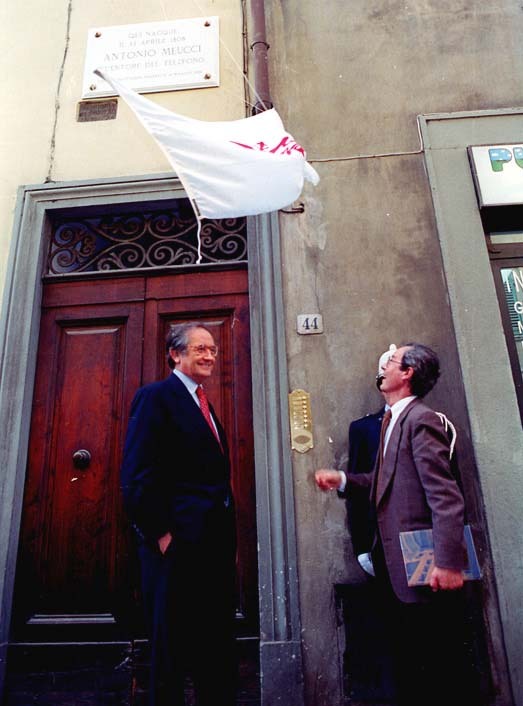 At that time (1989) I personally knew many important persons among the Italian organizations operating in the telecommunications field (manufacturers, service providers, universities and professional societies). Thus, I wrote a letter to them, to inquire whether anyone had notice of or ideas for celebrating that anniversary. Answers were negative, including those from Florence, where Meucci was born. It therefore appeared to me that, in Italy, only the journalists had an interest. This was not the case with the USA, where Italian-Americans of New York were going to amply celebrate that event (see photo below). Among them was a scientist from Comsat Laboratories, Washington, DC (also a consultant of my company), Prof. Pier Luigi Bargellini, a native of Florence, who offered me his help as a liaison with appropriate persons in the United States. 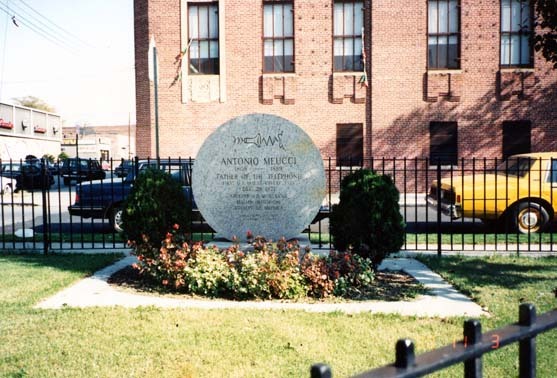 Monument to Antonio Meucci "Father of the Telephone" in Meucci Square, Brooklyn, NY, unveiled on 10 April 1989 by the Italian Historical Society of America. At that time, my knowledge about Meucci was superficial. I only knew that he was a Florentine immigrated to the USA and that he had something to do with the invention of the telephone. However, I imagined that his contribution to the telephone should not have been so important, as everybody acknowledged Alexander Graham Bell as the first inventor of the telephone. I must add that in my thirty-seven years’ work as a researcher in telecommunications I had learned a lot from the Bell Laboratories, where I could also count many friends, often met in international congresses. Hence, I was pretty inclined to believe that Bell must have deserved that fame, since such a wonderful organization had stemmed from his intuition and pioneering work. So … what about Meucci? At any rate, I brought the pile at home to browse through it during the next weekend. To my surprise, I found that Guglielmo Marconi, during his presidency of the Italian National Research Council (CNR), from 1927 to 1937, strenuously fought to uphold Meucci's merits. I learned that Marconi had first entrusted a law scholar, Dr. Francesco Moncada, also a teacher of Italian Language at the Columbia University in New York City, to investigate in the USA about Meucci’s story, and that, following Moncada’s report, he made publish a 130-page book by the CNR, on “The Telephone and the Priority of Antonio Meucci” . 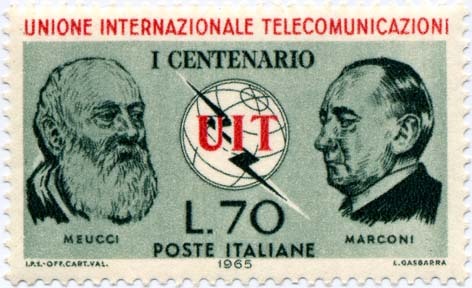 Marconi and Meucci jointly honored on the occasion of the Centenary of the International Telecommunications Union (ITU). At the same time, Marconi commissioned the Florence’s Galileo Laboratories to reconstruct the two most important Meucci’s telephone models (dated 1857 and 1867 respectively), to be sent to the International Exhibition “A Century of Progress” in Chicago, IL . This Exhibition was held in the month of March 1933, and the Italian pavilion at that exhibition displayed said two Meucci’s telephones along with an enlarged photograph of a page of The Chicago Tribune, dating back to 1885, recounting the “true” story of Meucci’s invention, as seen by his supporters and in line with Moncada’s findings . Finally, as reported by Frances Winwar, Marconi sailed to the USA to visit Meucci’s homestead (now “Garibaldi-Meucci Museum”) in Staten Island, and there he “stood uncovered before it” . All the above made me regard Meucci under a new perspective. 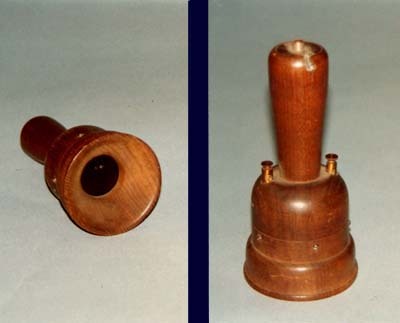 One of the two models of Meucci’s telephones (1857), reconstructed by Galileo Laboratories in 1933 upon instructions by Marconi. However, on the other side of the dispute, I found equally sound arguments, that were opposed to anyone inquiring about Meucci at the AT&T offices, namely, that Meucci was defeated in a regular lawsuit regarding his claims as the original inventor of the telephone. More specifically, the sentence issued on 19 July 1887 by Judge William J. Wallace of the Circuit Court for the Southern District of New York stated that “the proofs fail to show that he [Meucci] had reached any practical result beyond that of conveying speech mechanically by means of a wire telephone" . In other words, according to Judge Wallace, Meucci was a visionary, who had fooled himself while experimenting with a mechanical telephone, similar to the kids’ toy made by a string kept taut between two cans. Judge Wallace's statement was supported by the testimony of Prof. Charles R. Cross of the Massachusetts Institute of Technology (MIT). It was also pointed out that the Bell Company had won all of the about 600 lawsuits on the telephone that were instituted in the nineteenth century, thus bestowing on the Bell patents ample legal recognition. Both statements, however, were harshly criticized, not merely from Meucci’s supporters, but even from the Government of the United States. More specifically, for what concerns the lawsuit in New York, known as the “Bell vs. Globe trial" , Giovanni Schiavo, a renowned Italian-American Historian, following a serious and extensive analysis, concluded that Judge Wallace's decision had been “unquestionably one of the most glaring miscarriages in the annals of American justice,” as well as “one of the most dishonest legal decisions in the annals of America … [as well as] outrageously offensive” ]. Schiavo pinpointed many mendacious or suborned witnesses to the case, Judge Wallace's negligence to consider testimonies and proofs in favor of Meucci, and also remarked that Judge Wallace had already decided in favor of the Bell Company in four suits, using the same trick of the “wire telephone” to get rid of witnesses testifying to have spoken through the instruments of the opposing party. Schiavo advanced the hypothesis that Judge Wallace may have ruled that way to avoid a huge economic disaster following an eventual sentence against the Bell Company, given the extension of the existing Bell telephone systems throughout the Nation. Yet, the major opponent of Alexander Graham Bell and the Bell Company was the Government of the United States, who finally summoned both of them to the Courts. This latter trial, known as the “US vs. Bell trial” , had been neglected by Schiavo, who meritoriously concentrated his efforts on the Bell vs. Globe trial. 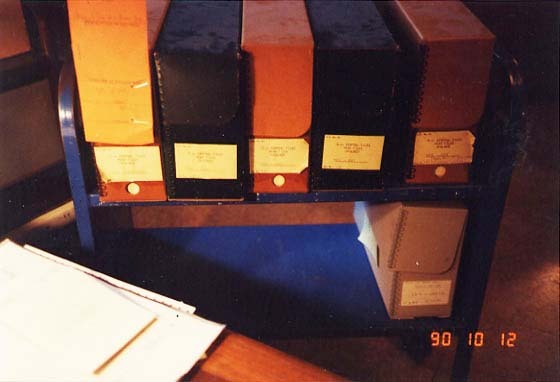 The findings relating to the US vs. Bell trial were the major outcome of my research, and showed that this trial was, in some respects, even more important than the former, despite the fact that its (manuscript or typescript) records were never printed and were difficult to find even in the U.S. National Archives. I discovered the massive files of this trial in Washington, DC, where, as indicated by Schiavo, I was actually looking for the papers of the appeal to the Supreme Court filed by the Globe Company against the verdict of the Bell vs. Globe trial in New York. A scrupulous clerk of the National Archives, upon my request to see any paper regarding Meucci, brought me a cart with six big folders, of which only a tiny part regarded the appeal I was looking for. However, I did not notice that at once, being the documentary material too big to be examined on site and therefore I managed to obtain photocopies, to bring back home for perusal. 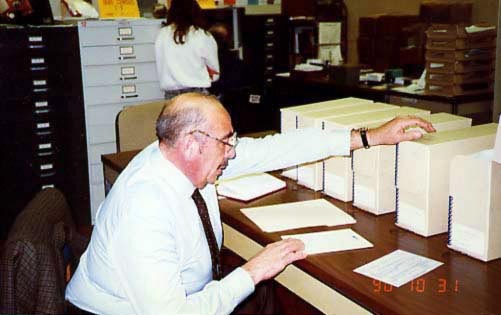 Folders retrieved at the National Archivesin Washington, DC (at left) and in Bayonne,NJ (at right). It took me four years before organizing and examining in detail those papers (in addition to the many others retrieved in New York), pertaining either to the U.S. Department of Justice or to the U.S. Department of the Interior (to the latter of which reported the Patent Office). I also thought advisable to type a good part of the manuscripts and scan them, together with typescripts and printed documents, and put everything on the hard disk of my computer to facilitate future search. [Viaggi ricerche photos]The Bell vs. Globe trial was instituted two months after the Government of the United States had filed its first Bill of Complaint, in Memphis, TN, against Alexander Graham Bell and the Bell Company, and just the day after the Secretary of the Interior, Lucius Q. C. Lamar, had begun public hearings to ascertain the existence of fraud in the obtainment of the Bell patents. It appears that the Bell Company, having learned that the Government would support Meucci's claims, thought to immediately sue Meucci in New York, where they had good chances to win quickly, thus creating a situation of "res adjudicata" in the trial with the Government, that they aimed to hamper as long as possible. This move of the Bell Company was harshly criticized by Secretary Lamar, in addition to Meucci's supporters. The claim of the Bell Company to have won all of the about 600 telephone suits was not wholly correct, since they did not win the trial with the Government (nor did they lose it since it was closed as moot twelve years later). In addition, Secretary Lamar remarked, in his official letter to the Department of Justice : "It appears that many suits have been pending and many are now pending between the corporation claiming this patent and others that assail it. In none of these cases has there been or can there be, as I think, such thorough investigation and full adjudication as to the alleged frauds or mistakes occurring in the Patent Office in the issuance of the patent, as could be had in a proceeding instituted and carried on by the Government itself. In a case involving such questions it seems to me especially imperative upon the Government, as duty to its own officers to vindicate or condemn, and duty to the people to set on foot and follow up a complete investigation. In my opinion the proceeding should be in the name of and wholly by the Government, not on the relation or for the benefit of all or any of the petitioners, but in the interest of the Government and the people, and wholly at the expense and under the conduct and control of the Government." The public hearings held by Secretary Lamar, with the help of his Assistant Secretaries Henry L. Muldrow and George A. Jenks, and the Commissioner of Patents, Martin V. B. Montgomery, were concluded on 14 November 1885. Thereafter each of Secretary Lamar's assistants made a report with his deductions from the hearings. In his report,Hon. George A. Jenks stated, in particular: " There is also evidence that as early as 1849, Antonio Meucci began experiments with electricity, with reference to the invention of a speaking telephone. . . . Up to 1871 . . . although much of the time very poor, he constructed several different instruments with which in his own house, he conversed with his wife, and others. . . . His testimony is corroborated by his wife, and by affidavits of a very large number of witnesses. He claims that in 1872, he went to Mr. Grant, Vice President of the New York District Telegraph Company, explained his invention, and tried repeatedly to have it tried on the wires of the Company. This, it is claimed, was used by the telegraph company, and was the basis of the contract between the Western Union Telegraph Company and the Bell Telephone Company, dated November 10, 1879. It must be noted that in the long report of the Honorable Jenks, only Philipp Reis and Antonio Meucci were mentioned as the inventors of the telephone that preceded Bell’s. The other Assistant Secretary, Hon. Henry L. Muldrow, wrote in his report: "So many witnesses having sworn that the inventions of Meucci, Reis, and others antedated those of Bell in the speaking telephone . . . I therefore believe it to be the duty of the Government to judicially inquire whether these facts do not warrant the institution of a suit to cancel the patent of March 7, 1876, which bears the seal of the Government, and which confers upon him a monopoly of the use of one of the forces of nature at the expense of whole communities." Finally, the Commissioner of Patents, Martin V. B. Montgomery, made the following remarks: "No matter how many suits might be brought and conducted to a termination by private litigants, there is but one way to actually invalidate, annul, and destroy a patent, and that is by suit such as is proposed in these petitions. . . . . In the absence of any defenses and in the absence of any explanation, a strong presumptive case was made out against respondents [Alexander Graham Bell and the American Bell Telephone Company], which would make it the clear duty of the Government to institute suit to vacate the patents. . . . . It is asserted on the part of the petitioners that Mr. Bell in this invention was anticipated by at least two inventors, Antonio Meucci and Philipp Reis, respectively . . . . In conclusion, I submit that, in my opinion . . . . the Department of the Interior should recommend to the Department of Justice that such a suit be brought." It clearly appears from these statements that the U.S. Government would rely on the prior inventions by Antonio Meucci and Philipp Reis to vacate Bell's patents. More specifically, Antonio Meucci was credited with the invention of the electromagnetic telephone, and Philipp Reis with the invention of the variable-resistance transmitter. The Globe Telephone Company, owner of the Meucci's rights on the telephone, did not much care of the Bell vs. Globe trial in New York, and therefore did not care to duly sustain Meucci's priority in the same trial. They did so not merely because, being sued by the Bell Company for patent infringement, they aimed to show that this was not the case, but chiefly because they trusted in the final victory of the Government in the US vs. Bell trial. Consequently, they also dropped the appeal that they had filed with the Supreme Court in Washington and this is why the records of this appeal that I found in Washington merely consisted of the printed transcripts of the records of the Bell vs. Globe trial in New York. Consistently with the above attitude, the Globe Company only filed in the New York trial nine out of the fifty affidavits in favor of Meucci that they had filed with Secretary Lamar in Washington and that were later forwarded by Secretary Lamar to the U.S. Department of Justice. I therefore found much more testimony in favor of Meucci in the records of the US vs. Bell trial, in Washington, DC, than in the records of the Bell vs. Globe trial in New York . Among the records found in Washington, I found one of exceptional importance: it was an affidavit titled "Meucci's Memorandum Book" , sworn by one of Meucci's lawyers, Michael Lemmi, where all of Meucci's laboratory notes on his telephone experiments were reported, translated into English and including all drawings, which were faithfully reproduced only changing the Italian labels into English. In this affidavit I found a drawing (see figure below) clearly showing that Meucci had invented a technique—known to telephone experts as the "inductive loading"—more than thirty years before it was patented by Michael Idvorsky Pupin . Pupin's patents were promptly acquired by the Bell Company and the inductive loading was then adopted in about all countries of the world. This drawing clearly shows a coil (with horseshoe core in layout No. 2, with linear core in layout No. 3) inserted midway along a long distance telephone line. In Meucci's experiment No. 4 the coil is split into two parts, one before the transmitter, the other after the receiver, exactly as would be indicated in Pupin's patents thirty years later. Meucci's drawing of his experiments on inductive loading, dated 27 September 1870. I rejected the charge of forgery in Meucci's Memorandum Book, as raised by a lawyer of the Bell Company , because, even admitting that the date of 27 September 1870, set by Meucci for this experiment, would be fake, the date of 28 September 1885 of the affidavit sworn by Michael Lemmi before a Notary Public of New York is legally certified and precedes anyway that of Pupin's patents by about fifteen years. Moreover, the dates marked by Meucci in his preceding and subsequent notes correspond to ascertained facts, such as his patents filed with the US Patent Office. I then concluded that, despite I had seldom found in the history of science such an advanced vision as Meucci's (except of geniuses like Leonardo da Vinci and few others), Antonio Meucci was tens of years ahead of other telephone inventors. From the long description in his Memorandum Book we learn that Meucci's "marine telephone" was housed inside the mask of the diver, and was fed by two insulated copper wires running inside the rubber tube conveying air to the diver. The man on board the ship would wear two equal receivers fixed on his ears, in order to be able to use his hands freely, to fulfill the requests of the diver. Hence, Meucci was also the first to invent the telephone headset. Meucci layout, said to have been faithfully reproduced by Prof. Cross (red arrow added by us). The above drawing of Meucci's inductive loading also unmistakably shows that Judge Wallace's argument, that Meucci's telephone was mechanical, is false. In fact, if, by absurd, the signal had been transmitted "mechanically" in layout No.1, it would fade away after the insertion of a coil along the line, as in layouts No. 2, No. 3 or two colis in layout No. 4. On the contrary, Meucci noted that he got satisfactory improvements and that he could get rid of the battery, as shown in all four layouts. 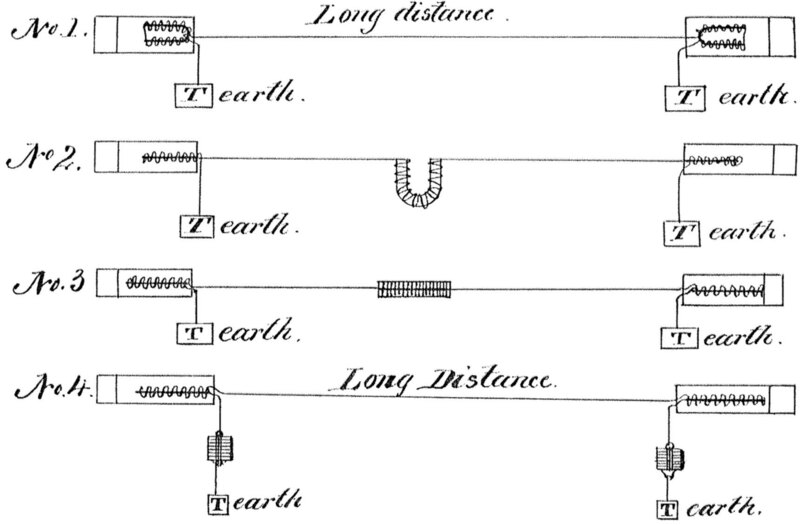 This fact was already ascertained by Meucci, as reported in another entry of his Memorandum Book, dated 20 May 1862, More precisely Meucci wrote: “At the midpoint of the wire, a strongly magnetized iron inside a coil. Do not need any battery at all, and is a good conductor of the sound” . This means that Meucci had discovered the effectiveness of the inductive loading since 1862—38 years before Pupin—to the point that he could transmit sound without a battery. It therefore appears that the novelty of his experiment of 27 September 1870 consisted in the improvement obtained by splitting the inductive load into two parts, as in layout No. 4 of the above drawing. The argument that, whenever a coil is inserted along the telephone line, it would hamper the mechanical transmission of sound also applies to the testimony rendered by Prof. Cross, supporting Judge Wallace's decision. In fact, Prof. Cross had stated  that he had carefully studied Meucci’s deposition, in order to faithfully reproduce Meucci’s many telephone models and layouts in his physics laboratory at MIT. Evidently referring to a drawing in Meucci's deposition (reproduced here at left ) he stated: "I have caused to be constructed instruments in accordance with this [Meucci's] caveat, containing every element or feature described in the caveat, connecting them by a wire fifty to hundred feet long, passed through several intervening rooms by going through the transom holes of the door, being supported by screw eyes or staples and fastened to the ceiling or door frames, the wire not being pulled very tight. With these instruments so constructed and arranged I have transmitted words after the manner of a lover’s telegraph or string telephone, and without the employment of electricity whatever." As can be seen from Meucci's original drawing reproduced here at left, Prof. Cross had omitted a reel of wire (indicated by a red arrow in the figure) that Meucci inserted in the second room, to simulate a long distance. There are, in Meucci’s deposition, two more drawings similar to the one reproduced here and five different answers where this reel of wire is clearly shown or quoted. Therefore, Prof. Cross (incidentally, a good friend of Prof. Bell) might have purposely omitted it. If he had inserted a reel of wire in his layouts, the sound could by no means mechanically traverse the same and reach the receiver; it could only be electrically transmitted. The same would have happened if he had inserted an inductive load, as recommended by Meucci (see also the drawing below ), for much the same argument. Meucci's two-way long-distance telephone conversation scheme (red arrow added by us). 2. The second phase of my research (1994-1999): glory and sorrow . . . I must point out that, in the first years of my research (1989 until the end of 1993) I could enjoy a consulting contract with my former corporate employer STET, by far the largest Italian telecommunications organization. This contract allowed me to pay my trips to Cuba and the United States (October-November 1990), in addition to the many trips to visit several archives in Italy. Thus, at expense of STET, I could visit all the places where Meucci had lived and get important documents from over fifty archives. As reported in my first paper on Meucci , my trips to Cuba and the United States together with the publication of my first book were authorized on 9 July 1990, during an assembly of the "Quadrato della Radio," which was held in Rome before the Minister of Posts and Telecommunications, Hon. Oscar Mammì. Note that the "Quadrato della Radio" (so christened after Marconi's "square" antenna, or "quadrato" in Italian) is an exclusive Association whose membership is bestowed on the—not more than 100—most important personalities of telecommunications. I was a member, and also part of the Directors' Council. Its president, Dr. Michele Principe, was also president of the STET Group. On that occasion, I reported on my preliminary investigations, limited to books and to a few inspections in some Italian archives, as well as on the many doubts that had arisen from them. My report was well received and, thereafter, until the summer of 1994, I could enjoy the full support of the Quadrato della Radio and the Ministry of Posts and Telecommunications, in addition to the patronage of STET. In my second paper, that I wrote after returning home from my trips abroad, I gave an extended and detailed account of my surveys in Cuba and the United States, but without drawing any conclusions. At the beginning of 1994, after I had discovered and studied Lemmi's affidavit—and drawn the many important conclusions outlined above—I thought it wise to make them known both in Italy and abroad. Note that in my two preceding papers  and  I had never credited Meucci with the invention of the telephone or any merits whatsoever. Now I felt comfortable enough in advocating his merits. The first favorable occasion came in June 1994, when I could profit of the Celebration of the Centenary of the discovery of radio by Guglielmo Marconi to present my latest findings on Meucci, as well as my first book "Antonio Meucci, l'inventore e il suo tempo" ("Antonio Meucci, the Inventor and His Times") , although only volume 1 was just printed, volume 2 being in the course of printing (actually, it was issued in 1996). The publisher of my book was SEAT, a company of the STET Group, whose main business was the publication of Yellow Pages for our Telephone Company, also part of the STET Group. Thomas Werner, General	Manager of the Vienna's Technisches Museum, who gave a lecture on Philipp Reis. I gave a lecture, in Italian , in which I disclosed the outstanding conclusions coming from Lemmi's Affidavit and illustrated in some detail the content of my book. The Lyncei Academy provided simultaneous translation from Italian into French and English and vice versa. The meeting was attended by most of the key people of the Italian Telecommunications, as well as by many personalities of the Roman elite and a number of foreign personalities, including officers from the U.S., French and Cuban Embassies in Rome. I concluded my speech as follows (translation from Italian): "I should like to point out two principles that have inspired me in the accomplishment of this research: first, not to indulge in the obstinate search of the sole and unique inventor, to worship at the monotheistic altars of science; second, that, at the threshold of the Second Millennium, we should enter a new era of our civilization: an era that does not recognize national boundaries other than those of the human species, in every part of the globe and in every epoch of our history." I was obviously—but naively—inviting on one side the Americans not to stick to their proverbial nationalism and refuse to accept the new evidence on Meucci, but also, on the other hand, the Italians not to indulge in their proverbial xenophilia, with much the same result. This statement was, happily, fully in line with Dr. Chynoweth's, as quoted below. All lecturers kindly spent a few words of appreciation of Meucci's work. Alan Chynoweth, however, added highly gratifying statements, even more so, as they came from the lips of a respected scientist of BellCore, a company reporting to AT&T. He stated, among other: ". . . When one compares the diagrams of the devices used by Bell and by Meucci, it is difficult not to be persuaded that Meucci’s was very similar and ought to have worked in much the same way. And with the benefit of hindsight, it is hard to swallow Judge Wallace’s technical conclusion in the famous patent case. Certainly, it seems to this reader that Meucci had something much more than the “Lover’s telephone”, two tin cans connected by a string, which is how the Judge described Meucci’s invention . . . . .From what is now known about Meucci’s work it seems very appropriate to regard him as truly one of the telephone pioneers whose achievements have too long been overshadowed by those of Bell and others. It would seem that he was a victim of the phenomenon of almost simultaneous invention, but if so, he was in very good company." In conclusion, the meeting at the Lyncei Academy had all the attributes to go down to history. Instead, it marked the beginning of an endless series of disappointments and troubles that seriously hampered the prosecution of my research. First, no publicity of this meeting was given in any media, despite the attendance of so many important persons, normally hunting for publicity in any possible occasion. Second, the publication of the conference proceedings was canceled. Shortly after, the publication of my book was stopped. I never knew who was behind those decisions (and Dr. Principe told me "you'll never know . . ."). As for my book (see details in "Antonio Meucci—The Inventor and His Times") although volumes 1 and 2 of my book, in Italian, had been published and the English translation of both volumes had been completed, they had to be followed by two more volumes and a compact disc. An English issue of the whole work was also planned. All these issues were canceled, in violation of my contract with the publisher, After several years of dispute, on 2 March 1999, my lawyers obtained that the copyright of the entire work be returned to me, in addition to a compensation for damages and legal expenses. Thereafter, however, I could not find an alternative publisher and this is why I recently (year 2010) resolved to post the printed material in Internet, to let a larger audience enjoy it freely. Given the impossibility to complete the publication of my book, I resorted to publishing papers and giving lectures on key subjects, in order to save as much as possible the basic results of my research. I first published a paper in the official magazine of the Italian Electrical Association (AEI)  and gave a lecture at the AEI main Section in Milan . Shortly after, I gave a lecture in Florence, at Palazzo Vecchio (Florence's City Hall) . On this latter occasion, a tablet was unveiled in Meucci's birth house in Florence by Dr. Guido Clementi, Florence's Councilor for Culture together with Dr. Umberto Silvestri, then C.E.O. of Tecnitel, a subsidiary of STET,This time, however, thanks to the support and presence of , we got a remarkable echo in the media. Peruse once more all the documentary material in my possession, in search of other possible "not yet invented techniques" that Meucci might have anticipated, as he did with the inductive load. The simplicity and modesty of true geniuses. Respighi, L., Per la priorità di Antonio Meucci nell’invenzione del telefono, CNR, Rome, 1930. 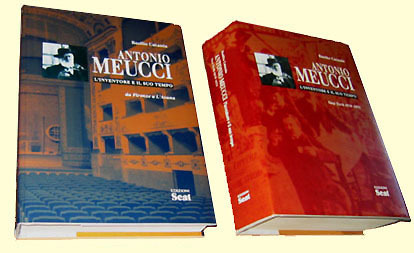 Second Edition: Luigi Respighi, Il Telefono e la Priorità di Antonio Meucci, Edizioni Italiane, Rome, 1939. This book was based on research by Moncada, who had died prematurely on November 20, 1933. His original 215-page typescript, titled Antonio Meucci, L’Inventore del Telefono, dated April 15, 1933 is now kept at the Staten Island Historical Society, 441 Clarke Avenue, Staten Island, NY. Moncada, however, managed to publish a short paper, summarizing his findings: Antonio Meucci Inventor of the Telephone, Atlantica, Vol. 13, No. 5, August 1932, p. 201-204. Rossi, C., Dalla rana di Galvani al volo muscolare (From Galvani’s frog to muscular flight), U. Hoepli Publisher, Milan, 1940. Editorial Office of ‘The Chicago Tribune’, Telephone Patents - The Application to Use the Name of the United States in a Suit against Bell - A Promising Movement to Annul the Patent and Break the Great Monopoly - The Claim of Antonio Meucci - Sketches and Illustrations of the Inventor’s Instruments, The Chicago Tribune, Monday, November 9, 1885, p. 3. Winwar, F. (Pulitzer Prize), The Monument in Staten Island: Meucci, Garibaldi and the Telephone, E. Clemente & Sons Editors, Chicago, IL, 1957. Opinion by Judge Wallace, William J. in the case of American Bell Telephone Co. et al. vs Globe Telephone Co. et al., rendered July 19, 1887, The Federal Reporter, 31 F. 729. "Bell" stays for "The American Bell Telephone Company" and "Globe" stays for "The Globe Telephone Company," who acquired Meucci’s rights on the telephone. Schiavo, G. E., Antonio Meucci, Inventor of the Telephone, The Vigo Press, New York City, NY, 1958. Catania, B., The U.S. Government Versus Alexander Graham Bell: An Important Acknowledgment for Antonio Meucci, Bulletin of Science, Technology & Society, Vol. 22, No. 6, December 2002, pp. 426-442. Letter from Hon. Lamar, L. Q. C., Secretary of the Interior, to Hon. John Goode, Acting Attorney General, dated January 14, 1886, National Archives and Record Administration, College Park, MD, RG 60, DJ 6921-1885, No. 479 of 1886. The American Bell Telephone Co. et al. vs. The Globe Telephone Co. et al., National Archives and Records Administration, Northeast Region, New York, NY. Printed volumes are also available at the New York Public Library, Annex. Affidavit of Michael Lemmi (Translation of Meucci’s Memorandum book), sworn September 28 1885, National Archives and Records Administration, College Park, MD, RG 60, Department of Justice, Year Files Enclosures 1885-6921, Box 10, Folder 1, 230/3/46/6 (originally filed in RG 48, Department of the Interior, file 4513-1885, Enclosure 2). Pupin, M. I., Art of reducing attenuation of electrical waves and apparatus therefore, US Patent 652,230, filed December 1899, granted 19 June 1900; Pupin, M. I., Method of reducing attenuation of electrical waves and apparatus therefore, US Patent 652,231, filed December 1899, granted 19 June 1900. Argument of James J. Storrow: The Meucci defense and its falsity, "American Telephone Co. et al. vs. National Improved Telephone Co. et al.," Records of the US Circuit Court for the Eastern District of Louisiana, National Archives and Records Administration, College Park, MD. Affidavit of Charles R. Cross, Records of the U.S. Cir¬cuit Court for the Southern District of New York, "The American Bell Telephone Co. et al. vs. The Globe Telephone Co. et al. - “Deposition of Charles Cross, Exhibits and Affidavits,” National Archives & Records Administration, Northeast Region, New York, NY. Deposition of Antonio Meucci, Defendant’s Exhibit No. 120: Affidavit of Antonio Meucci, sworn 9 October 1885. Records of the US Circuit Court for the Southern District of New York, “The American Bell Telephone Co. et al. vs. The Globe Telephone Co. et al.,” National Archives and Records Administration, Northeast Region, New York, NY. Catania, B., Sulle tracce di Antonio Meucci - Appunti di viaggio (“On the tracks of Antonio Meucci—Trip Notes”), L’Elettrotecnica, Vol. LXXIX, No. 10, October 1992, p. 973-984, I never credited Meucci as the inventor of the telephone. Catania, B., Lecture at the International Conference on the Telephone Pioneers [in Italian], organized by the "Quadrato della Radio" and "Fondazione Marconi," Rome, Accademia dei Lincei, 1 June 1994. Catania, B., Un documento inedito rivaluta l’opera di Antonio Meucci (“An unpublished document revalues the achievements of Antonio Meucci”), AEI - Automazione, Energia, Informazione, Vol. 82, No. 2, February 1995, p. 32-40. Catania, B., Antonio Meucci: un grande italiano da rilanciare in campo internazionale (“Antonio Meucci, a great Italian to be relaunched internationally”), Lecture at the Italian Electrical Association (AEI), Milan, 27 March 1995. Catania, B., Antonio Meucci - L’Inventore e il suo tempo (“Antonio Meucci—The Inventor and His Times”), Lecture at Palazzo Vecchio - Salone dei Gigli, Florence, 16 May 1996. Catania, B., La labor precursora de Antonio Meucci sobre el teléfono desde La Habana hasta Clifton ("Antonio Meucci's pioneering work on the telephone, from Havana to Clifton"), Revista Bimestre Cubana, La Habana, Vol. LXXIX, Época III, No. 4, January-June 1996, p. 49-63. Catania, B., Antonio Meucci Revisited, Antenna, Newsletter of the Mercurians, in the Society for the History of Technology, Denver, CO (USA) Vol. 9, No. 1, November 1996, p. 4-5. Catania, B., The United States Government versus Alexander Graham Bell - An important acknowledgment for Antonio Meucci, traduzione di F. Ricciardi, distribuita in occasione del 150° Anniversario dell’arrivo di Antonio Meucci a New York, il 1 maggio 2000, insieme allo speciale annullamento postale della busta celebrativa.